A musty odor in your home or mold in your crawl space are signs of a moisture problem. Advanced Basement Systems can fix your damp crawl space with an ENERGY STAR-rated dehumidifier or ventilation fan. Schedule your free on-site consultation and cost estimate today! High humidity in your crawl space can damage your stored items, cause wood rot, and affect the indoor air quality of your entire home. If you have a vented crawl space with a moisture problem, you'll likely feel and smell it upstairs. A SaniDry dehumidifier helps prevent crawl space moisture as well as maintain an ideal level of humidity in your living space. The SaniDry Sedona offers giant performance in a small package. The Sedona easily fits in small crawl spaces, yet has a powerful blower to effectively dry large areas. Automatic drainage - No need to empty the reservoir. Filter - Removes mold spores and dust mites (good for allergies and asthma). Auto humidistat - Shuts off the unit when desired relative humidity is achieved to save energy. Health: Adding a dehumidifier in your crawl space can prevent mold and dust mites, alleviate allergy and asthma symptoms, and improve the indoor air quality of your whole house. Comfort: High humidity levels in the crawl space can make the air upstairs feel soggy. A crawl space dehumidifier can help maintain a healthy humidity level year round and even save you money on cooling costs. Pest Prevention: Controlling moisture reduces the chances of termites and other pests in the crawl space. Structural Safety: A dehumidifier helps protect your home from wood rot in the crawl space and buckling floors. Energy Savings: If you turn on your air conditioner to lower the humidity in your home, you're probably spending more money on your energy bills than you need to. A dehumidifier can help maintain a healthy humidity level in your home. Where does crawl space moisture come from? Standing water or puddles in your crawl space can be caused by a plumbing leak or a drainage problem around your home. If left there, the water will eventually evaporate into the air in the crawl space. Ground moisture in a dirt crawl space constantly evaporates into the crawl space air. Moisture inside the foundation walls can also evaporate into the air. Outside air enters the crawl space through vents and openings and cools down when it enters the crawl space, raising the relative humidity inside. For the best results, we recommend installing a vapor barrier along with a dehumidifier. By sealing your crawl space off from the outside, we can create a space that's dry, clean, and healthy. With the CleanSpace encapsulation system, you'll not only gain extra storage space, but your entire home will be more comfortable! Other crawl space moisture control solutions include sealing crawl space vents, adding drainage to remove standing water, and installing the Crawl-O-Sphere forced-air ventilation system. If you're experiencing mold, buckling floors, termites, or rising utility costs caused by issues in your crawl space, Advanced Basement Systems can help. We specialize in crawl space repair solutions, and we know what it takes to prevent humid air and excess moisture from damaging your home. Call us today at 1-844-320-1542 or contact us online to get a free estimate on crawl space dehumidifier installation. 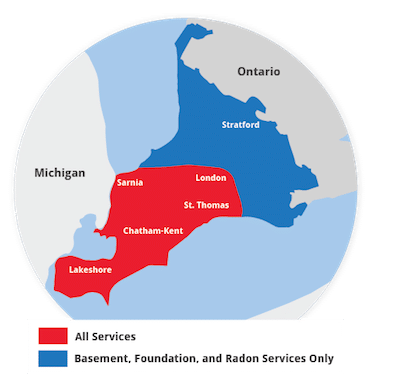 We provide our crawl space encapsulation and repair services in London, Windsor, Chatham, Sarnia and surrounding areas in Ontario.